I Worked on a House! – He Said What?! I Worked on a House! 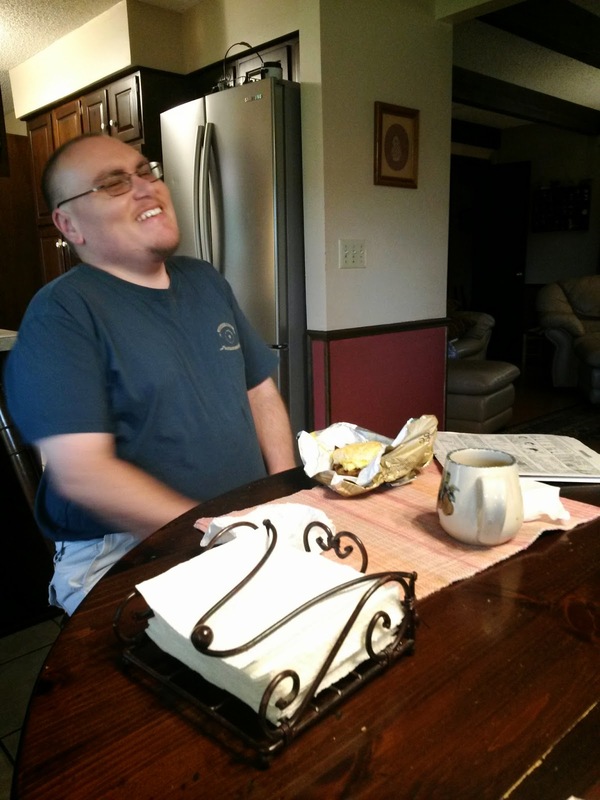 As I wrote in my last blog, Aaron had a rough seizure day on Tuesday of this week. When he made it downstairs that morning, he said, “Mom, I don’t feel good. The reason was……I’m guessing was……I couldn’t sleep well last night.” Thankfully, he doesn’t remember his seizures and so he was trying to understand why his head hurt and why he felt terrible. He had another seizure later that morning. His whole day was spent on the couch. That night I played a game of Skip-Bo with him. It was sad to just sit there and watch him…..so slow and clumsy. He had a hard time holding the cards, and it took him a long time to think of the moves to make…..decisions which usually come quickly to him. In fact, when we play Skip-Bo he is often urging me to hurry up. But on this night he was really out of it. I prefer the quick, sharp Aaron for sure……even when he’s trying to cheat! But on Wednesday he was well enough to go to his day group, and by Thursday he was fully back to normal. On Thursday morning I took him with me to Chick-fil-A, where we got a free breakfast biscuit. We brought it back to the house and sat at our table, enjoying every bite. I was enjoying Aaron’s laughter, though, and his being back to his usual funny self. That afternoon, when he returned from his day group, he bounded in the house in his usual loud fashion. He found me downstairs and as always, with no hello or any other greeting, he immediately said, “Mom! I worked on a house today! !” He then excitedly explained that he had gone with Brian, one of the staff, to work on one of Paradigm’s residential houses. Brian is getting this new house ready for clients to move into, so Aaron was one that went with Brian to help. Well, I know Aaron loved that because he always wants to help me cut vegetables in the kitchen. You know…..a guy and a knife. But this isn’t always a good mix with Aaron involved. I asked Aaron if he liked all this house work that he did. So I let him tell Dad that he worked on a house, while I watched Aaron grin from ear to ear as he talked. He paced the family room over and over as he talked about the “fire detectors” and the carpet and the tools. It was fun to see……and I knew that Gary shared my surprise at this working on a house business that Aaron has rarely enjoyed before. Now I wonder what Brian would add to that…..but I’m not sure I’ll ask. I want to relish the thought of my new handyman Aaron, at least for a while. And there was one more element to this working day that Aaron had. Lunch. Aaron’s favorite activity, by far. Well, isn’t that the most appetizing meal I could imagine? I know that Aaron will never be a promoter for a restaurant. I’ll mark that off his possible job list. Aaron, it’s not the food that’s BIG. Later, Aaron and I took Jackson on a walk around our back yard. After all that BIG food, I especially wanted to take Aaron on a walk! It’s hard being a house person, isn’t it, Aaron? Hard for you…..but so much fun for me! He Said What?! Blog at WordPress.com.